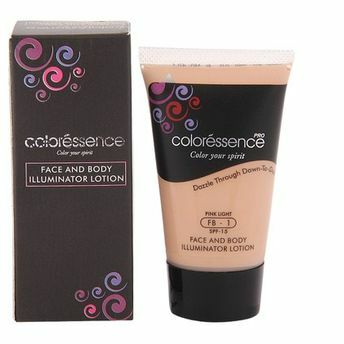 Coloressence Face & Body Illuminator on India's online beauty store Nykaa & get discounts and COD. Coloressence Face and Body Illuminator is a genius lotion which illuminates your skin and gives you radiant glow. It contains quality ingredients which moisturizes your skin and lends you a glow within. The extremely light texture almost resembles with gel. It spreads evenly on your skin and get absorbed easily. After complete absorption it gifts you crystal clear complexion. It has pleasant fragrance which gives you a cool, fresh feeling. Packed in a hygienic tube you can carry it while travelling. Additional Information : Coloressence is a well - known make-up and beauty brand in India. It is part of Nature?s Essence brand which provides women trendy and affordable beauty products. Coloressence Face and Body Illuminator is available in two shades and makes your skin naturally beautiful. Explore the entire range of Highlighters available on Nykaa. Shop more Coloressence products here.You can browse through the complete world of Coloressence Highlighters .Alternatively, you can also find many more products from the Coloressence Face & Body Illuminator range.